Is MP3HD the future of digital music? WinAmp, command line encoders... it's the 1990s all over again! For all its joys, MP3 is an old format - and it's lossy, which means no matter how high the bitrate you never get a perfect copy of the original audio. Thomson, the firm that helped invent MP3 in the first place, has come up with a solution - MP3HD, and you won't need to bin your existing kit as the file format will still play on normal MP3 players. MP3HD is a lossless format, which means it delivers a perfect digital copy of the original audio - but it manages to do it more efficiently than WAV or AIFF files, which can be massive. At the highest quality setting MP3HD files are around 2/3rds of the size of a WAV file, so you can stuff more CD-quality files into your portable player or hard disk. Of course, lossless formats already exist in the form of FLAC, WMA Lossless, Apple Lossless and several others, but support for those formats is fairly limited: you can't play an Apple Lossless file on a Sony smartphone, or a FLAC file in an iPod. MP3HD has been designed to solve that problem, and it works on anything that can play MP3s. If the program or device supports MP3HD you'll get full CD quality; if it doesn't, you get a 320Kbps MP3. So does it work? We ripped a song (1234 by Feist) in uncompressed WAV format, then converted it into multiple formats: WMA Lossless, Apple Lossless, FLAC and MP3HD. As you can see, there's not much difference in file sizes. As promised, the MP3HD file simply appeared as a plain old MP3 in programs that don't support the format, so our file played quite happily in iTunes and Windows Media Player. What about sound quality? On good quality headphones, we think there's a very slight difference between a 320Kbps MP3 and a full quality MP3HD file when tracks get busy (the ending of 1234 is good for this as there's all kinds of stuff going on: banjo, trumpet, backing vocals and so on). But it's so slight we may have imagined it. As for the competing lossless formats, we couldn't hear any difference between them at all. So what can you actually play MP3HD on? So far the answer is WinAmp, WinAmp and WinAmp. 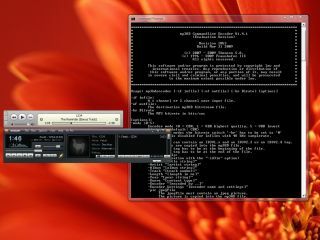 At the time of writing there isn't a single hardware player that supports MP3HD, and the software is limited to a solitary WinAmp plugin and an MP3HD command line encoder. Over time, though, MP3HD support should start to appear in commercial music software and hardware - provided the developers can see a market for it. Will they? We're not convinced, largely because we've been here before. Nearly eight years ago Thomson announced a new, higher quality kind of MP3 called MP3Pro. Like MP3HD, it was backwards compatible, so your files would play on any MP3-supporting program or device; like MP3HD, it offered better sound quality by combining a high quality and low quality version in the same file. If your device didn't support MP3Pro you'd get the low quality one; if it did, you'd get the high quality one. It was very clever, and with the exception of MusicMatch Radio, hardly anybody used it. MP3Pro was followed in 2004 by MP3 Surround, which offers multichannel MP3s and was embraced by hardly anybody. We suspect MP3HD is destined for the same fate. MP3HD works, but there isn't a dramatic difference between a 320Kbps MP3 and the HD version - especially if you're listening through iPod headphones, which are hardly the highest fidelity. MP3HD is also up against several other lossless formats: TTA, WavPack, Monkey's Audio, WMA Lossless, FLAC and Apple Lossless. Of those formats, three in particular are going to make MP3HD's life difficult: FLAC, which is the format of choice for audiophiles on Bittorrent; WMA Lossless, which is baked into Windows Media Player; and Apple Lossless, which works on iPods, in iTunes and in AirTunes. For MP3HD to take off Thomson needs to persuade FLAC users to switch, Windows Media Player users to install yet another codec (when it arrives) and Apple to add MP3HD support to iPods and iPhones. If that doesn't happen - and we suspect it won't - then MP3HD is MP3Pro all over again.